Wayward Girls' Crafts: Upcycling Baby Clothes for the Fourth! 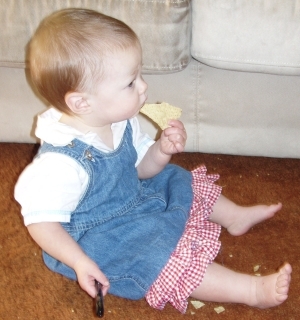 Be sure to check out my guest post on the fastest crib sheet in the West at Creative Cowgirl! Most of my kids' clothes are borrowed from their cousins or gifts, so I wouldn't dare cut them to pieces, even to make another cute outfit. But when a friend from church was getting rid of her granddaughter's out-grown clothes, I finally had a chance to make an upcycled baby outfit! 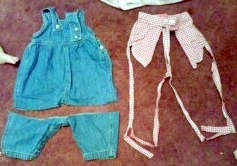 I started with 3-6 month denim shortalls and red and white gingham pants (not sure what size, but probably 2 or 3T). I trimmed the legs off the overalls. The legless top fit my then-two-year-old. With the pants, I cut the seams off. (For some reason I decided only to take a picture of the seams here). From there (after a hiatus of about a year from the project), I cut the pants into 2" strips lengthwise. I got 8 strips out of them. 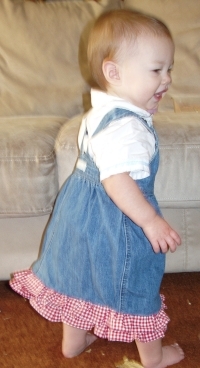 I sewed them into two big circles, about twice the circumference of the shortalls. After I hemmed one side, I was ready to make them into ruffles. 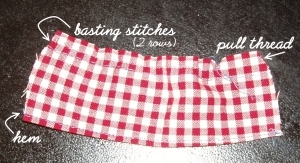 To gather the fabric, use two rows of very long (basting) stitches. Once the rows are in, you just pull the thread to gather the fabric into a ruffle. Once it's small enough, tie the ends of the thread together to make sure the gathers don't come undone on the other end as you redistribute them. I used a 1.5" wide strip of scrap muslin between the two layers of ruffles, and I topstitched the denim above the top layer. It ended up a little longer on her than I expected, but still very cute! The red, white, and blue color scheme was perfect for the day before the Fourth of July :D.
Oh my goodness! What an adorable outfit! And the fact that you made it from old outgrown clothes is awesome. this is so darling:) i love it and your model is so cute!!! Thanks so much for linking up to "Tell me Tuesdays!" This is fantastic :) I love upcycling clothes! Absolutely adorable. I would love for you to share this project on my Inspiration Board. Oh my this is just so adorable. Love it. Gorgeous outfit - great upcycle! such a cute idea for upcycling clothes for baby...thanks for sharing on ff! Thanks for linking up at Craft Junkie Too. Absolutely darling!! Thank you for linking up! Stopping by from the Homemaker In Heels Party. I would LOVE for you to link up to My Favorite Things Friday Party going on all week! Also be sure to enter my $50 Giveaway through Sunday night. That is so adorable as a dress!! Great job. Love your upcycled denim jumper. 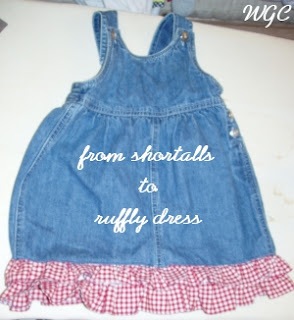 Great way to re-purpose those too small shortalls. Just visiting from the craft school Sunday link party. Best wishes.